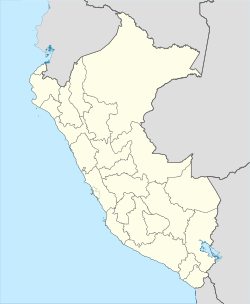 Callao (/kɑːˈjaʊ/; Spaingie pronunciation: [kaˈʎa.o] or [kaˈʝa.o]) is the lairgest an maist important port in Peru. The ceety is coterminous wi the Constitutional Province o Callao, the anerlie province o the Callao Region. Callao is locatit wast o Lima, the kintra's caipital, an is pairt o the Lima Metropolitan Aurie, a lairge metropolis that haulds amaist ane-third o Peru's population. Callao borders Lima Province on the north, east an sooth, an the Paceefic Ocean on the wast. Callao wis foondit bi Spainyie colonists in 1537, juist twa years efter Lima (1535). It suin became the main port for Spainyie commerce in the Paceefic. The oreegin o its name is unkent; baith Indie (pairticularly Yunga, or Coastal Peruvian) an Spainyie soorces are creditit, but it is certaint that it wis kent bi that name syne 1550. At the hicht o the Viceroyalty, virtually aw guids producit in Peru, Bolivie, an Argentinae war carriet ower the Andes bi mule tae Callao, tae be shippit tae Panama, carriet owerland, an then transportit on tae Spain via Cuba. On 20 August 1836, durin the Peru-Bolivie Confederacy, Preses Andrés de Santa Cruz mandated the creation o the Callao Littoral Province (Provincia Litoral del Callao), which haed poleetical autonomy in its internal affairs. Durin the govrenment o Preses Ramón Castilla, Callao wis gien the name o Constitutional Province (Provincia Constitucional), on 22 Aprile 1857; afore that, Callao haed the name o Littoral Province. Aw o the ither Peruvian provinces haed been gien thair names bi law, while Callao wis gien it bi constitutional mandate. Callao wis niver pairt o the Lima Depairtment nor o ony ither depairtments. The province's first mayor wis Col. Manuel Cipriano Dulanto. Bi 1949, Callao wis kent as ane o the biggest centers o coca-based products an cocaine traffeck in the warld. In 1746, a tsunami caused bi an yirdquauk destroyed the entire port o Callao. On 2 Mey 1866, durin the Battle o Callao, the Spainyie fleet treed tae reconquer independent Peru. On 19 Juin 1986, hunders o preesoners wur massacred on El Frontón. Callao is biggit on an aroond a peninsulae, the destrict o La Punta, a walthy residential neebourheid. A historical fortress, the Castillo de Real Felipe (steid o "Rodil's Last Stand"), staunds on the promontory owerleukin the harbor. A lairge naval base is steidit in Callao. Its preeson haulds Abimael Guzmán, the leader o the Shinin Path rebel muivement, an Vladimiro Montesinos, the ex-director o internal security durin the Fujimori regime. Jorge Chávez Internaitional Airport is locatit in Callao. On a bluff owerleukin the harbor sits Colegio Militar Leoncio Prado, the militar heich schuil. The ceety haes a varsity an aw, the Naitional University o Callao. The main Naval Hospital, Centro Medico Naval is locatit on Avenida Venezuela in Bellavista. It contains the U.S. Navy command Naval Medical Research Unit Six. Callao haes several islands: San Lorenzo (currently a militar base), El Frontón (a umwhile heich security preeson), the Cavinzas, an the Palominos, whaur numerous sea lions an sea birds live in a virtually untoucht ecosystem. Thare are proposed plans tae big a huge naval, terrestrial, an air port on San Lorenzo Island. This project is cried the San Lorenzo Megaport Project. Residents o Callao are kent as chalacos. Callao's professional fitbaa teams are Sport Boys an Atlético Chalaco. Jorge Chávez Internaitional Airport (IATA: LIM, ICAO: SPIM), kent as Aeropuerto Internacional Jorge Chávez in Spainyie, is Peru's main internaitional an domestic airport. It is locatit in Callao, 11 km (6.8 mi) frae the Historic Centre o Lima an 17 km (11 mi) frae Miraflores. Callao is the port ceety nou fully integratit wi Lima, the naition's caipital. In 2008, the airport handled 8,288,506 passengers an 98,733 aircraft muivements. For mony years it wis the hub for nou defunct Aeroperú an Compañía de Aviación Faucett, ane o the auldest airlines in Laitin Americae. Nou it serves as a hub for mony aviation companies sic as TACA Perú an LAN Perú. Local govrenment affairs are dividit intae twa levels. Regional matters are handled bi the Regional Govrenment o Callao (Gobierno Regional del Callao), which is locatit in the Bellavista Destrict. Affairs sic as ceety cleanin, promotin o sports an basic services are handled bi the Provincial Municipality o Callao, which is heidquartered in the Callao Destrict. An aw, each o the sax destricts haes its awn Municipality which handles matters in thair respective jurisdictional auries. Callao is dividit intae 7 destricts, (Spaingie: distritos; singular: destrito), each o which is heidit bi a mayor (alcalde). * The rest o Callao Region is composed o the islands o San Lorenzo, El Frontón an Cavinzas, which aw thegither hae an aurie o 17.63 square kilometres (6.81 sq mi). The port is servit bi the Ferrocarril Central Andino railwey, which in 2006 is tae be modrenisit frae narrae gauge o 3 feet (914 mm) tae the warld staundart gauge o 4 ft 8 1⁄2 in (1,435 mm). The Peruvian author Mario Vargas Llosa attendit the militar schuil an referred tae it in his first novel, La Ciudad y los Perros (1962) (published in Inglis as The Time of the Hero in 1963). The beuk wis adaptit as a film entitled The City and the Dogs (1985). It featurt exterior shots o the schuil. Callao is the refuge place for the subjects o the Rudyard Kipling poem The Broken Men. Wikimedia Commons haes media relatit tae Callao. This page wis last eeditit on 26 Januar 2019, at 03:48.